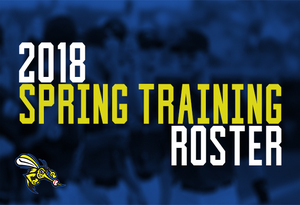 (Sugar Land, Texas, March 15, 2018) – The Sugar Land Skeeters announced today their partial 2018 Spring Training roster. Among the players invited to this year’s Spring Training are former Major Leaguers: Dallas Beeler, Charles Brewer, Alejandro Chacin, Aaron Crow, Kyle Kubitza, Zach Lee, Jose Ortega, and Denis Phipps. A number of former Skeeters have also been invited to return, including: Brett Marshall, Mitch Talbot, Albert Cordero, Anthony Giansanti, Ryan Jackson, and Willy Taveras. In addition to the mix of former Major Leaguers and returning Skeeters, former Bluefish and 2015 Atlantic League Player of the Year Welington Dotel has been invited to this year’s Spring Training. Major League veteran and former Skeeter Willy Taveras returns to Sugar Land with 17 years of professional baseball experience. After spending the first five seasons of his career in the Cleveland Indians and Houston Astros systems (2000-2004), Taveras made his Major League debut with the Astros on September 6, 2004 at 22 years old. The outfielder would spend the next two seasons in Houston, batting .285 and racking up 67 stolen bases with the club. Over the next seven seasons, Taveras would spend time with the Colorado Rockies (2007-2008), the Cincinnati Reds (2009), and the Washington Nationals (2010). While with the Rockies in 2008, he would steal a career record 68 bases (which led the National League) for the club over 133 games. In 2015, Taveras made his Atlantic League debut with the Skeeters, racking up 60 hits and 21 stolen bases over 65 games. He returns to Sugar Land after spending the last two seasons in the Mexican League, batting over .300 for both the Pericos de Puebla (2016) and the Acereros de Monclova (2017). Pitcher Aaron Crow joins the Skeeters roster with eight years of professional baseball experience, four of which were spent in the Majors. In 2008, the right-hander was drafted in the first round (9th overall) by the Washington Nationals out of the University of Missouri Columbia (Columbia, MO), and again in the first round (12th overall) by the Kansas City Royals the following year. Crow would spend four years in the Royals system (2011-2014), making his Major League debut for the club on March 31, 2011 and was named an All-Star the same year. Following a brief stint in the Chicago Cubs system in 2016, Crow joins the 2018 roster with an overall record of 20-11 in 254 games and a career ERA of 3.43 over 233.2 innings pitched. Welington Dotel, 32, makes his debut with the Skeeters after spending the second half of the 2017 season with the Bridgeport Bluefish. A native of Neiba, Dominican Republic, Dotel began his professional career in 2006 with the Arizona League Mariners, an affiliate of the Seattle Mariners. After spending the next nine seasons with a number of minor league systems, the outfielder would make his Atlantic League debut with the Bluefish in 2015, where he was also named an All-Star and Atlantic League Player of the Year after winning the batting title hitting .340 with 68 RBI. He also led the league in hits (180), triples (13), and stolen bases (45) over 133 games for the 2015 season. Dotel would once again post impressive numbers with the club over the next two seasons, batting .335 over 95 games in 2016 and .271 over 43 games in 2017. Further information on Spring Training, individual tickets, and promotional schedule will be released soon. For more information, call 281-240-4487. Visit SugarLandSkeeters.com and follow us on Facebook, Instagram and Twitter (@SL_Skeeters) for all the latest news on the team. Download the official Sugar Land Skeeters app to keep up with the team all year long with news, score updates, stats and more. The free app is available in both the App Store and Google Play. The Skeeters play at Constellation Field, a state-of-the-art stadium located at the intersection of State Highway 6 and U.S. Highway 90A in Sugar Land. The Skeeters are a member of the Atlantic League of Professional Baseball (ALPB) and play 126 regular season games. The Skeeters Baseball Foundation promotes youth education and healthy activities lifestyles by providing support to culturally, racially and economically diverse areas of the community. For more information please call 281-240-4487 or visit sugarlandskeeters.com.